Drinking caffeine not only helps you stay awake, but it can aid in healthy weight management and boost athletic performance. 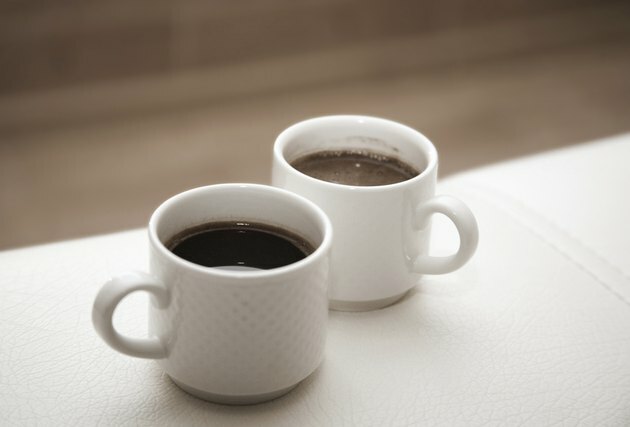 Caffeine may even affect your body's metabolism. Too much caffeine can be counterproductive, however. Always chat with your doctor before boosting your caffeine intake, and consume it in safe amounts. Numerous studies have examined effects of caffeine on metabolism, or your body's energy expenditure. A review published in 2011 in "Obesity Reviews" examined six such studies and found that caffeine supplementation significantly increases your body's energy expenditure over a period of 24 hours. Caffeine often causes a boost in energy and decreases in perceived physical exertion, which may be one reason your body burns extra calories when you consume caffeine. Consuming caffeine with catechins -- found in green tea -- not only enhances your body's daily energy expenditure but significantly increases fat oxidation, according to the review published in 2011 in "Obesity Reviews." Fat oxidation is beneficial when you're trying to shed pounds and burn excess body fat. Researchers who conducted this study, however, concluded that although ingesting caffeine without catechins does boost energy expenditure, consuming caffeine without the catechins doesn't affect fat oxidation. Although caffeine is beneficial when you need an extra boost of energy, caffeine does have some disadvantages. A review published in 2011 in "Frontiers in Neuroscience" reports that caffeine can cause learning deficits, anxiety, panic attacks and hallucinations -- especially when consumed in doses greater than 300 milligrams per day. Caffeine is also an addictive substance. Authors of this review suggest that some caffeine consumers experience withdrawal symptoms -- such as fatigue and depression -- when they eliminate caffeine. If you and your doctor decide caffeine is a good fit with your lifestyle, it's best to consume it in recommended amounts. TeensHealth suggests it's safe for adults to ingest up to 300 milligrams of caffeine daily, while teens should consume no more than 100 milligrams of caffeine each day. The 2011 review in "Frontiers in Neuroscience," however, reports that 300 milligrams of caffeine can increase tension and anxiety, and ingesting more than 300 milligrams of caffeine daily raises your risk for hallucinations. An 8-ounce cup of brewed coffee provides 80 to 135 milligrams of caffeine, 8 ounces of green tea contain 15 milligrams and an 8-ounce serving of brewed tea generally contains 40 to 60 milligrams of caffeine, notes the University of Utah.